Lucas Crumley, of Columbus, joins the team as assistant district director. Crumley served the constituents of Ohio’s 12th Congressional District for more than seven years with Congressman Tiberi’s district office. He has focused on building community partnerships and assisting constituents with federal agencies. An alumnus of both Otterbein University and The Ohio State University’s John Glenn College of Public Affairs, Crumley will continue managing casework staff and district outreach. In addition to his congressional experience, Crumley served as a commissioned officer in the United States Marine Corps and remains actively engaged with the central Ohio veterans’ community. Brittany Madni joins the team as Congressman Balderson’s legislative director. Madni most recently spent two years working for the House Budget Committee, and brings with her extensive experience in federal budgeting, health care policy, and congressional oversight. A graduate of Boston College with bachelor’s degrees in political science and English, and George Washington University with a master’s degree in legislative affairs, Brittany has more than five years of Capitol Hill experience and is charged with overseeing Congressman Balderson’s legislative portfolio and priorities. Erin Collins joins the team as communications director. Collins brings both political and congressional communications experience, previously serving with the National Republican Congressional Committee, as well as former Congressman Bruce Poliquin’s (ME-02) office and former Senator Dean Heller’s (NV) office. 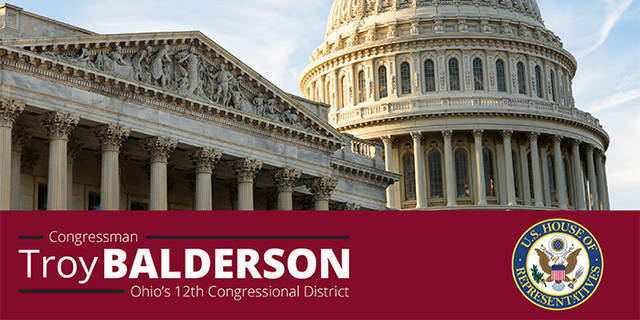 A graduate of University of Nevada’s esteemed Reynolds School of Journalism, Collins will use her expertise in media relations and strategic communications to help craft and steer the communications vision for Congressman Balderson’s office. Clark Siddle, of Upper Arlington, joins the team as deputy director of communications. Siddle offers a unique background in both policy messaging and constituent services innovation, most recently serving as deputy director for constituent and coalition communications for the 24-member Ohio Senate majority caucus. A graduate of The Ohio State University, where he earned dual degrees in strategic communications and political science, Siddle will oversee the development and implementation of an array of constituent services and engagement efforts for Congressman Balderson’s office. Previous hires Teri Geiger, chief of staff, and Laura Engquist, deputy chief of staff, remain on board with Congressman Balderson’s office. Balderson welcomed eight additional staff members who also hail from around Ohio, including New Albany, Columbus, Dayton, Lewis Center, Gahanna, and Grove City.